The Department of International Relations is under the Faculty of Management and Social Sciences at Godfrey Okoye University. This department offers a four year programme for the award of Bachelor of Science (B.Sc.) degree with focus at producing a flow of competent and confident graduates whose minds are well developed and who are intellectually sound in the field of International Relations, capable of propounding useful theories that can proffer solutions in national and international politics. 1. To stimulate in students an appreciation of theories in International Relations and other tools of analysis, and applications in different contexts at the national and international level. 2. 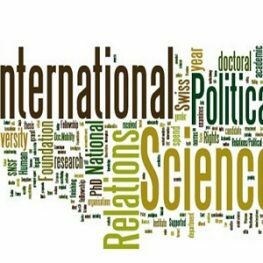 To develop in students the ability to apply their international relations theories, analytical tools, knowledge and skills to the solution of problems in international politics. 3. Provide students with a broad and balanced knowledge with practical skill in International Relations. 4. Develop in students a range of skills that are relevant to the both Governmental and non-Governmental agencies at home and abroad. 5. Provide students with relevant knowledge and skills for further studies in International Relations as a multi-disciplinary field of study. 6. Generate in students the appreciation of the importance of international relations in a national, political, economic and social development on the one hand and in the maintenance of global peace and security on the other. 1. Candidates seeking admission must have five qualifying credits in WASSCE/NECO, GCE/0’level, obtained in not more than two sittings. These credits must include, English and Mathematics, and three other relevant subjects. 2. An acceptable pass in the UTME entrance Examination. Direct Entry: Candidates for Direct Entry admission shall possess five credit passes in the SSCE, NECO, GCE or equivalents of which at least two shall be at advanced level, or four credits passes of which at least three shall be at advanced level provided that such passes are not counted at both levels of the examinations. For emphasis credit passes in English Language, Mathematics and three other relevant subjects are compulsory. All students must fulfill the basic entry requirements of the university in order to gain admission. The programmes under the Faculty of Management and Social Sciences have four years duration for general entry students and three years for direct entrants. Deg 1 IRE 101 Intro. to International Relations I, 2 units. Deg 1 IRE 103 Ancestors of the Contem. Inter. System, 2 units. Deg 1 IRE 105 History of Europe I (1300 – 1648), 2 units. Deg 1 IRE 117 Elementary German I, 2 units. Deg 1 MAN 101 Introduction to Business, 3 units. Deg 1 POL 101 Introduction to Political Science, 3 units. Deg 2 IRE 205 Pol. Thou. Since Plato Machiavelli, 3 units. Deg 2 IRE 211 Structure of International Society, 2 units. Deg 2 IRE 213 Elements of Contem. Global Studies, 3 units. Deg 2 IRE 281 Elementary French ,2 units. Deg 2 POL 221 Introduction to Political Analysis, 2 units. Deg 2 POL 231 Nigeria Politics I, 2 units. Deg 2 POL 241 Introduction to Comparative Politics, 2 units. Deg 3 IRE 303 Diplomacy, 3 unit. Deg 3 IRE 305 Laws of Nations, 3 units. Deg 3 IRE 311 International Political System, 3 units. Deg 3 IRE 363 International Economic Relations I, 2 units. Deg 3 IRE 377 Theories of International Relations, 3 units. Deg 3 IRE 383 Intermediate French III, 2 units. Deg 3 POL 361 History of Political Thought I, 2 units. Deg 3 POL 381 Logic & Method of Political Inquiry, 3 units. Deg 3 PUB 371 Theory & Practice of Administration, 3 units. Deg 4 IRE 411 Tech, Ecology & Environ. Issue in W. P. 2 units. Deg 4 IRE 425 The Middle East in World Politics, 2 units. Deg 4 IRE 431 Contemporary Strategic Studies, 3 units. Deg 4 IRE 437 International Law, 3 units. Graduates of International Relations from Godfrey Okoye University can be employed at public and private sector establishments, Embassies and Consular Offices etc.